FREEZER MEAL: Prepare as directed. Split into 2 9"x9" pans. Cover tightly and freeze one. To cook, thaw in refrigerator. Bake at 350° for 40-45 minutes, or until hot. Cook the rice. I cooked it with 4 cups of water and 1/4 cup of butter. Mix the 2 cheeses together. In a large bowl mix the shredded chicken with the enchilada sauce, refried beans and half of the cheese. Add rice, season with salt and pepper if needed, and mix well. Pour rice mixture into a 9"x13" or 2 - 9"x9" casserole dish. 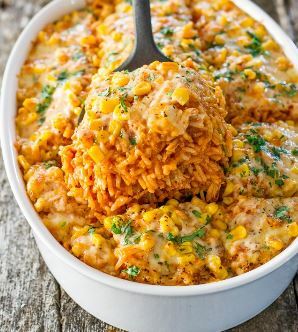 Top with corn then with remainder of cheese. Bake for about 20 to 30 minutes or until cheese melts and is bubbly. Garnish with chopped cilantro and serve warm.